The Chesapeake Region of the Antique Automobile Club of America, is honored to be hosting the 2018 Eastern National Spring Meet, The meet is being held at the beautiful Wyndham Hotel, one of the nations premier venues for this type event, in historic Gettysburg, PA. This venue will accommodate the show field, swap meet, car corral, trailer parking, awards banquet, and social events. We also have a number of bus and driving tours planned. We look forward to having you join us in “celebrating historic vehicles in an historic location”. 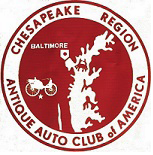 You can click on the above logos to access the Chesapeake Region and AACA websites. You can click on any of the photos on the website for an enlarged version.